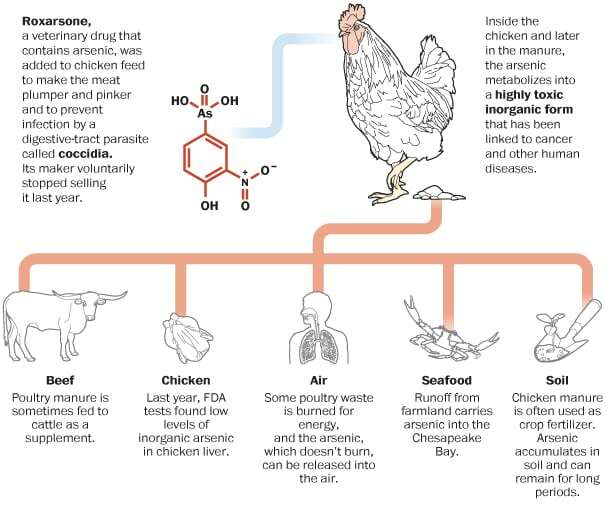 Here’s the good news: Maryland is set to ban the use of arsenic-based drugs in chicken feed–which are used to combat a gut-eating parasite, and (apparently this is also viewed as a plus) burst small blood vessels which makes the meat look pinker and more appealing. Inorganic arsenic has been linked to various human ailments, including neurological deficits in children, said Keeve E. Nachman, director of the Farming for the Future program at the Johns Hopkins University Center for a Livable Future. Pfizer, which distributes the drug, agreed to voluntarily suspend its sales after consulting with FDA officials following the study. But growers that stockpiled supplies continue to use it. Del. Tom Hucker (D-Montgomery), who sponsored the House version of the legislation, said the General Assembly was concerned about the levels of arsenic in chicken; about the 30,000 pounds of arsenic added each year to the soil in fertilizer and manure, mostly on the Eastern Shore; and about arsenic washed by heavy rains into rivers and streams that flow to the Chesapeake Bay. Just one more grotesque insight into the astounding and unappealing practices which constitute our meat production industry. 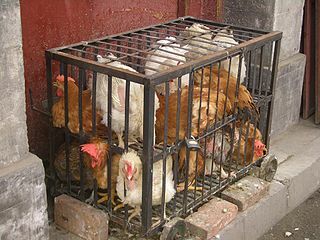 But, never mind, have at those chicken nuggets, friend. They’re cheap and they taste good, right?